Abnoba is the Goddess of the Black Forest, a region with many therapeutic springs such as the famous Baden-Baden. 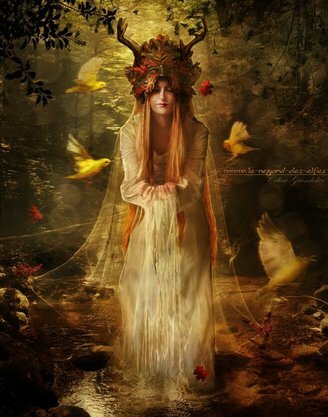 Her Celtic name is related to the word for river and is the source of the English river name "Avon"
Unfortunately, there is little known about Abnoba. Any real information about her is scattered, diminished and/or all together lost. The Romans identified Her with Diana and there was an altar dedicated to Her at the mineral springs of Badenweiler at the edge of the Black Forest. Goddess of childbirth as well as the Patroness of all Waterways, She is the protector of woods, springs, rivers and wild animals. As with many ancient Gods and Goddesses, Abnoba is known by many names, including Abnoba, Avnova, Abna, Dianae Abnobae, Dea Abnoba, Abnova and Abnoba the Huntress. One of the altars at the Roman Baths in Badenweiler, Germany and another at Muhlenbach identify her with Diana, the Roman Goddess of the Hunt. The Romans also named a town after her. This Romano-Celtic town known as Abonae lies at the mouth of the Avon River in England and was named for and dedicated to Abnoba. The Romans also built many shrines to her, associating her with Diana. PETITION: Petition Abnoba to help preserve wild nature, forest plants and animals. FAVORED PEOPLE: Those possessing strong associations with the Black Forest or the forest in general. ALTAR: Decorate Abnoba’s Altar to evoke the deep forest using pine cones, forest animal images, fir boughs etc.